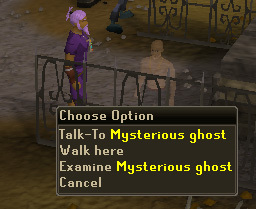 Speak to the Mysterious Ghost outside Glarial's Tomb. 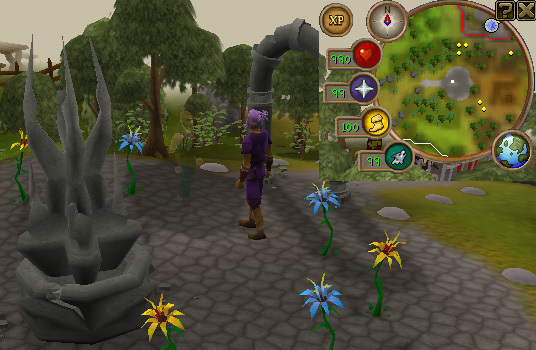 Note: You can get a Ring of Visibility from Rasolo, north of Ardougne, and a Ghostspeak Amulet from Father Urhney in Lumbridge Swamp. Make sure you are wearing your Ring of Visibility and your Amulet of Ghostspeak. You can't see the ghosts without the ring, and even if it is on, they do not appear on minimap. 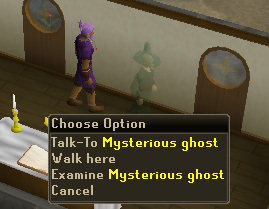 Outside of Glarial's Tomb north of Ardougne, you will find a Mysterious Ghost. He is cursed, and will talk about Armadyl's Staff. After he has told you his story, you will receive a Ghostly Robe Top. He will ask you to find another ghost, the thief Rennard. From now on, each ghost that you must talk to are in order, and the location of the ghosts is different for everyone. 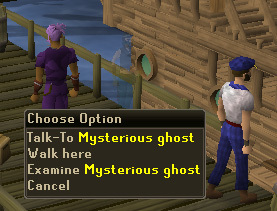 If you speak to the correct ghost at the wrong location (you are given a location), it will not work. The Crashed Pirate Ship in Level 56 Wilderness. Bandit Camp in the Wilderness. Bandit Camp Bar in the Desert. Once you find him and speak to him, he will give you a pair of Ghostly Gloves. Then he will ask you to find Kharrim the Messenger. Chaos Altar in Level 38 Wilderness. End of the Lava Maze near the Lesser Demons. 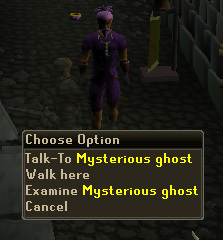 After speaking to him, he will give you a pair of Ghostly Boots and ask you to find Lenissa the Spy. In Port Sarim, near the boat from the Dragon Slayer Quest. Upstairs of the Falador Party Hall. The first floor of the Wizard's Tower, near the Bookshelf. Inside the Entrana church building. After speaking to her and listening to her story, you'll receive the Ghostly Robe Bottom. She will ask you to speak to her superior named Dhalak the Mage. Upstairs in the Prayer Guild, near the Altar. Inside the Falador Party Hall. First Floor of the Wizard's Tower near the Bookshelf. He will give you a Ghostly Hood and ask you to look for Viggora the Warrior. Paddewa, Edgeville Dungeon, near the Earth Warriors. Second floor of the Rogue's Castle in the deep Wilderness. Second floor of the Canifis Slayer Tower, just before the Infernal Mages. 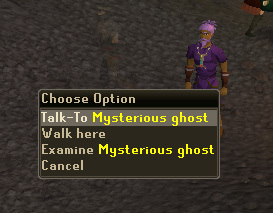 After hearing his story, you'll receive a Ghostly Cloak from him! 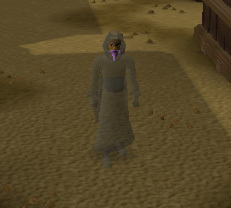 Congratulations, you've found all of the Ghost Robe pieces! Yes, you're transparent and you can see right through yourself! 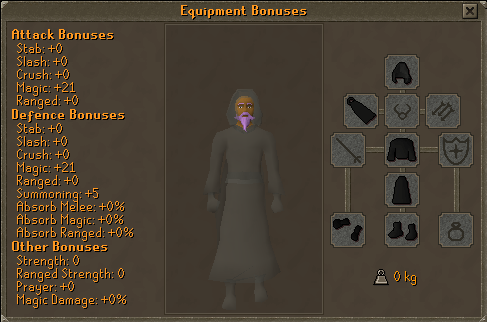 The full set of robes provides 21 to your both your Magic Attack and Magic Defence bonuses. They give no other bonuses and are un-tradeable.